Not far from the gardens of the Taj Mahal stands the important 16th-century Mughal monument known as the Red Fort of Agra. This powerful fortress of red sandstone encompasses, within its 1.5 mile-long (2.5km) enclosure walls, the imperial city of the Mughal rulers. It comprises many fairytale palaces, such as the Jahangir Palace and the Khas Mahal, built by Shah Jahan; audience halls such as the Diwan-i-Khas; and the Sheesh Mahal (The Glass Palace), which is inlaid with thousands of mirrors and was once the harem dressing-room. 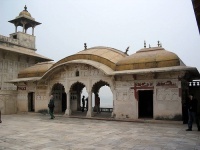 There are also two beautiful mosques, including Shah Jahan's Pearl Mosque. The Octagonal Tower is exquisitely carved, and is the very place where Shah Jahan spent the last seven years of his life. The tower used to be known for providing one of the best views of the Taj Mahal - which is significant as Shah Jahan famously built the Taj as a memorial to his wife and no doubt enjoyed this view - but these days, regrettably, air pollution has reduced visibility. Not all of the areas and buildings in the Red Fort are open to visitors but there is plenty to see. Local guides are available at the entrance and hiring one is recommended because the fort has accumulated many great stories in its long history. Try to arrive early to avoid crowds and queues.